THERE ARE so many shapes, sizes and abilities in the sphere of the full-back. You can have the speed of Stuart Hogg, the guile of Ben Smith or the ruggedness of Mike Brown. One man with all the facets of a world-class 15 is Israel Folau. He’s embraced the skills required from three codes – league, union and Aussie Rules – and wrapped them into a consummate package. So important is he to Australia that Michael Cheika excused him the European tour to rest him for bigger battles ahead. Folau’s skill-set allows him to play at full-back, wing and even outside-centre. His physical attributes are there to be seen, but the skills he possesses and his reading of the game make him even more dangerous than what meets the eye. The best full-backs adopt great footwork to beat defenders and create space. Folau is no different. He lulls a defender into going one way before shifting his weight onto his sidestepping leg and changing direction at high speed. 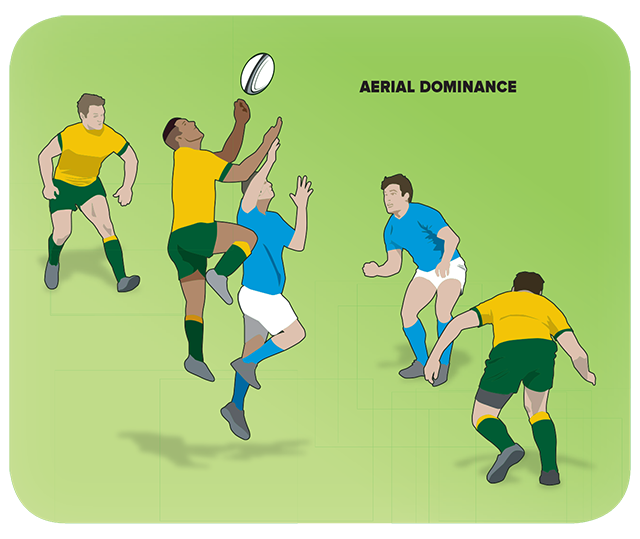 Committed defenders struggle to tackle him and even if they do, Folau’s height (6ft 4in) and strength allow him to offload. He’s also a master at lines of support. He runs a hard, short angle when coming from the back or a 45-degree run inside ten or 12 that gets him away from covering defenders. He also has the ability to drift onto a ﬂ at pass to the outside (illustrated below) and make a subtle in-to-out movement to get outside defenders. 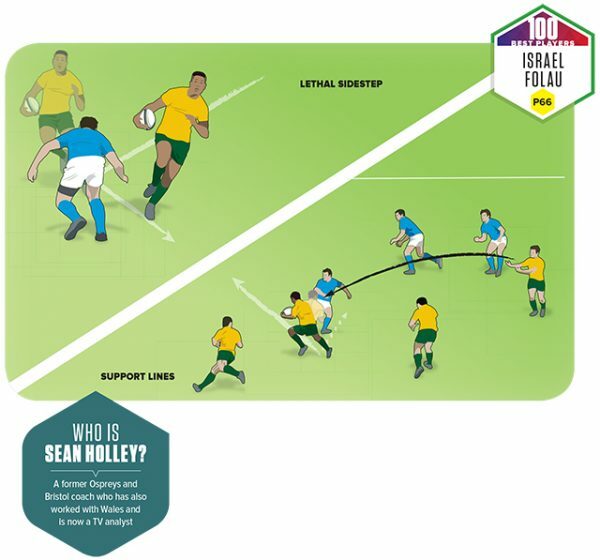 Folau has taken the basics of an Aussie Rules catch and turned it into an art in union. His relationship with ﬂ y-half Bernard Foley is something to behold and the detail of his execution is key. His timing of where to take off from his last step, to the trajectory required to coincide with the ball, is unsurpassed. He’s a brave man as his height and athleticism mean he can get a long way from the ground, while his spatial awareness and landing ability is outstanding. It makes him a brilliant try-scorer. Decision-making plays a huge part in pro rugby. 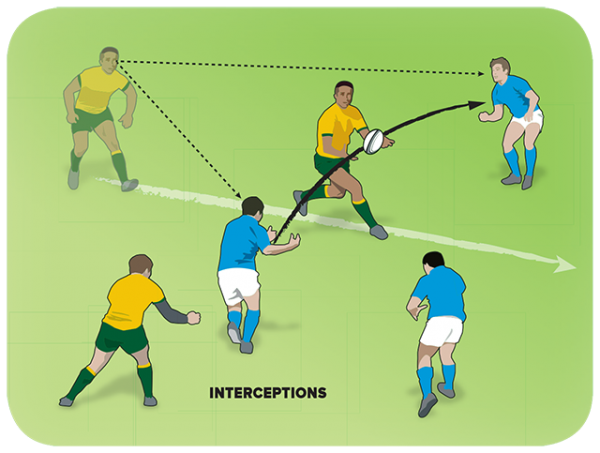 Folau’s reading of attacking situations when he’s defending in the wider channels is excellent and he gains a high percentage of interceptions that often lead to tries. His pace gives him the conﬁdence but his spatial awareness and timing are crucial. He watches both the ball-carrier and support player to decide if the pass is long enough to allow him to pounce. Footwork drills are relevant only if you carry the ball in two hands and practise transferring the ball from one hand to another. Coaches should incorporate obstacles and defenders, and try to provide realistic scenarios. 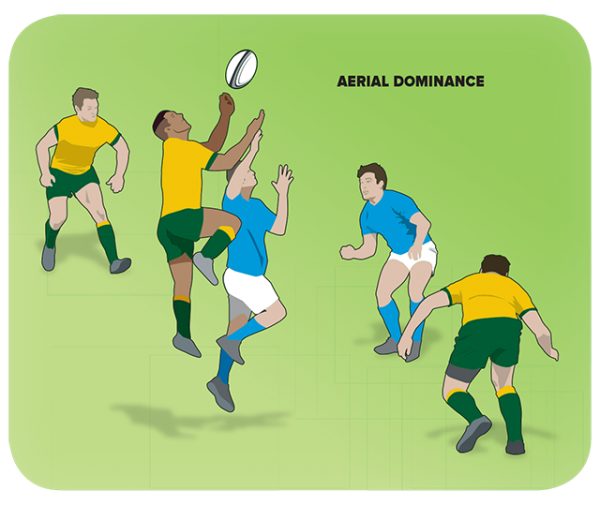 Practise beating more than one defender or getting half-caught to promote offloads. This can then be used to coach support lines to run off your key sidesteppers. When running support lines, players off the ten run in straight lines. 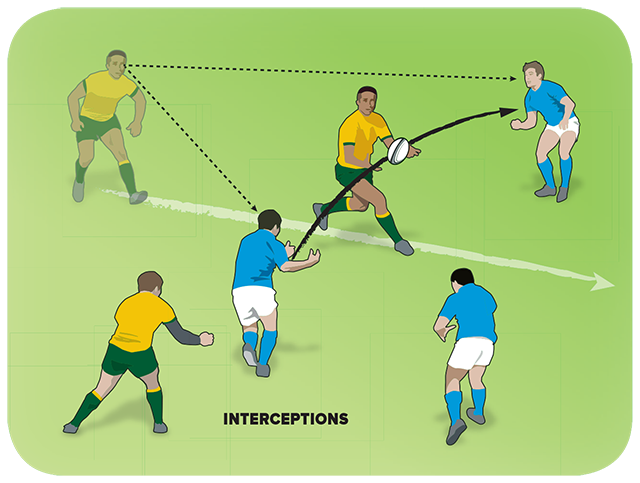 You must create deception and Folau does this using his step and speed. He makes a run and changes direction on the timing of a pass, so he takes the ball going in a diff erent direction to what the defender expected a split-second before. Depth and speed of run is important here and you have to practise with live defenders. Folau’s footwork on the approach to his jump is key. He increases or decreases this depending on his timing. His last stride enables him to generate all the power necessary from his ‘plant leg’, much like a high jumper, and with the thrust propulsion of his arms he glides to the point of contact. His head is always still and eyes transﬁxed on the ball. His lead leg is at 90 degrees for balance and protection, and Folau may even use this to ‘lean’ on opponents to gain further height. His hands are in a high position, goalkeeper style, and his ﬁngers are spread. He will aim to catch the ball just above his eyeline. To go for interceptions I tell players: “You’re either 100% right or 100% wrong!”. This means you have to commit. Once you’ve made that decision you have to go… and good luck!